Marvel Strike Force is a squad-based RPG that lets you recruit your favorite superheroes and villains, build a formidable team and engage in tactical combat against a deadly new threat. You will have access to several of your most-loved characters, such as Spider-Man, Captain America, Hulk, Rocket Raccoon and many more! Each character has its own signature attack style and watching them in action can be gratifying experience for many fans. 3D animated fight scenes are something you have never seen in any mobile game! Marvel Strike Force lets you assemble a team of heroes and villains, but there are separate campaign missions for each squad. You can team up heroes and villains in “Challenge” mode. You will also get access to various game modes such as raids, arena and alliance war as you progress and reach higher levels. Fans of tactical RPGs will love everything about this game and this guide aims to help them achieve victory in campaign missions and challenges. HP and speed gauges appear above your enemies’ heads. The green gauge is the HP bar and the blue bar underneath the green gauges displays speed. Characters act according to their speed. So when the blue gauge fills up, an enemy will act according to his/her role (protector, brawler etc.). They will attack, heal or use special abilities. Your superheroes also do the same, but you will be controlling their actions. When the blue gauge is full, a circle will appear beneath your squad member. You can use his abilities or tap the primary attack button to hit enemies. Look for characters with a single green bar above them. You can easily take them down by attacking them once or twice. However, you will need a little more effort to defeat enemies that have two instead of one HP gauge. When the blue bar fills up, an enemy will attack. For example, three enemies will act one by one if all of them have full blue (speed) bars. When your turn arrives, examine blue bars of each enemy character and target a character whose gauge is the lowest of all to make sure his turn never comes. This way you can get rid of one enemy even before he/she attacks. Enemies that have an almost full blue gauge will attack very soon and that’s inevitable. What you can do is target the most dangerous enemy, such as a healer who has the ability to refill HP of all characters or a mini-boss who deals massive damage to your characters, and eliminate them as soon as possible. Your priority should be to target enemies, starting from the most dangerous to the least dangerous opponent. Recruit characters that can inflict negative effect, such as “Slow” to their enemies. With a slowdown effect, an enemy’s blue bar will fill up slower than the others. Using Luke Cage’s Beat Up ability, there’s a 30 percent chance of a “Hero” ally to assist. 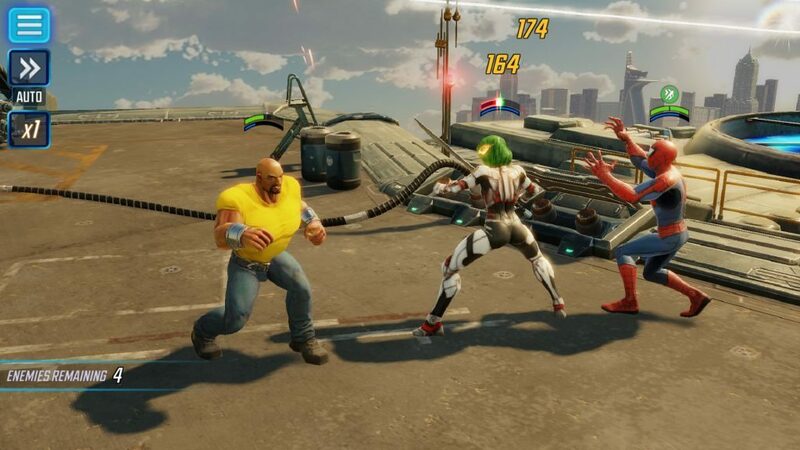 With Spider-Man in my team, I have found that both Spidey and Luke Cage attack villains when I use Cage’s ability. You can check which ability has a matching trait advantage by going to “Roster”, tapping a character and then tapping an icon under the “Abilities” section. Power level (PL) decides how strong your team is against enemy’s team. The higher the power level, the easier it would be to defeat waves of enemies. Unlike other hero collecting games, Marvel Strike Force does not show recommended level in every mission, which will make it hard for you to ascertain the strength of your enemies. The only solution is to keep increasing your team’s PL at regular intervals. To do this, you will have to increase each character’s power level. There are various ways to do so, but equipping gear is the easiest option to improve a superhero’s PL, which will ultimately increase your squad’s PL. Before equipping gear to your characters, you should know how to get them. The easiest way to get them is by completing campaign missions. You can also receive gear from free orbs that are available every 4 hours. Once you have collected equipment, quickly tap “Roster” to get a list of your unlocked characters. The green plus sign beside each character indicates that a material can be equipped to him. Tap the character’s portrait and then tap the glowing empty slot to equip gear and increase his power level. There are various types of gear and some of them are unique to a particular character. For example, the “web shooter” can only be equipped to Spider-Man and Bracer’s are unique to Luke Cage. However, there are quite a few common materials that can be equipped to more than one character, example – serum. Collect and equip six materials to a squad member to complete a set and upgrade his gear tier. Doing this not only increases his power level, but also key stats such as Health, Damage, Resistance etc. Equipping a set of six materials is one of the ways to increase character and team’s PL. When you get a new character, you may have noticed that the first two abilities are unlocked. But what about others? Well, you can unlock them after upgrading your character to a certain gear tier. For example, Spider-Man’s “Tangled Web” ability (3rd ability) can be unlocked when he reaches gear tier 3. Collect gear and equip it to your characters to complete sets. Next, upgrade them to new tiers to unlock new abilities. Training is another way to increase a character and team’s PL. 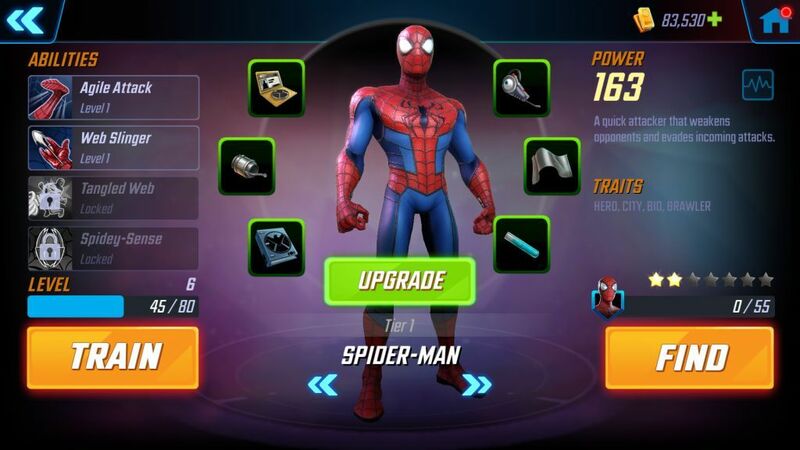 You must have enough “training modules” to level up a superhero or villain. A training module contains XP and the amount of XP depends on its color. Modules are color-coded based on their effectiveness. A green module provides less XP than a blue module, so you will have to spend less blue module to reach a new level. Gold modules are the rarest of them all and can be very useful to quickly level up a character. You can receive training modules as mission and challenge rewards and on completion of certain achievements. To train a character, go to “Roster” and select a character. Next, tap the “Train” button and then tap a blue, green, purple or gold training module to level up your character. If you want to fill empty slots of a character’s gear page, then you will have to find them first. Luckily, the game allows this. Just tap an orange plus sign and the tap the big blue “Find” button to know how to get equipment. A new page will show a list of locations, such as missions, supplies and orbs. It will also display a list of characters that need the gear. However, you may also have to fulfill certain conditions, such as reaching a certain character level before you can equip it to him. 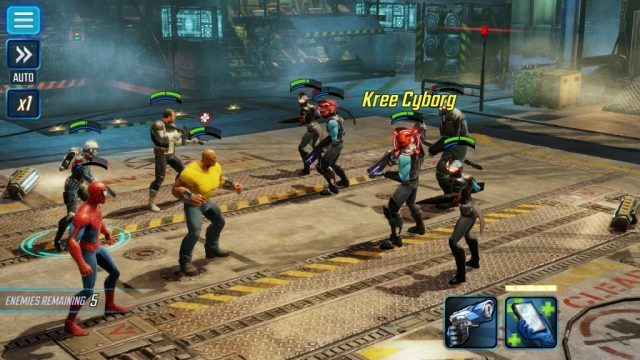 Marvel Strike Force characters have unique combat roles, and having various characters with different roles will help you beat enemies faster. Blasters and Brawlers deal heavy damage, whereas Protectors are “tank” characters with a unique “taunt” ability that forces enemies to attack only them for one turn. Controllers have unique abilities. Some use stealth and camouflage abilities that makes them hard to detect. Others have the ability to clear positive/negative effects (Focus, Slow, Stun, Bleed etc.). Blasters usually posses some kind of a weapon and you will notice that quite a few characters use them to inflict area damage to multiple enemies. Brawlers specialize in close combat fighting are pretty quick while attacking enemies, inflicting major damage to the primary target and some damage to a character standing beside him. Since protectors are extremely tough and boast high HP and damage, they can be used in situations where your key characters HP has drained quite a bit and you don’t want to lose him/her their abilities can be vital in defeating enemies. Support characters provide support by healing team members, although healing isn’t the only abilities of some characters. They may also apply stealth or regeneration to a fellow character. You must at least have a Protector, Brawler, Blaster and Support character in your superhero or villain squad. 1. Complete achievements: The achievements section has a list of tasks. Complete them to get shards. You will can get Hulk shards only from achievements. Also, don’t forget to log in every day to get daily rewards. You might get Spider-Man and other shards on some days. 2. Finish limited-time events: The events section in your home screen often shows a list of special missions. You will have to complete them before time runs out to get hero/villain shards. As of writing this guide, the event section has two missions that will let you earn Elektra and Crossbones Shards. 3. Get shards from free orbs: You will get a free orb in every four hours. Basic orbs contain shards, so don’t forget to open them. 4. 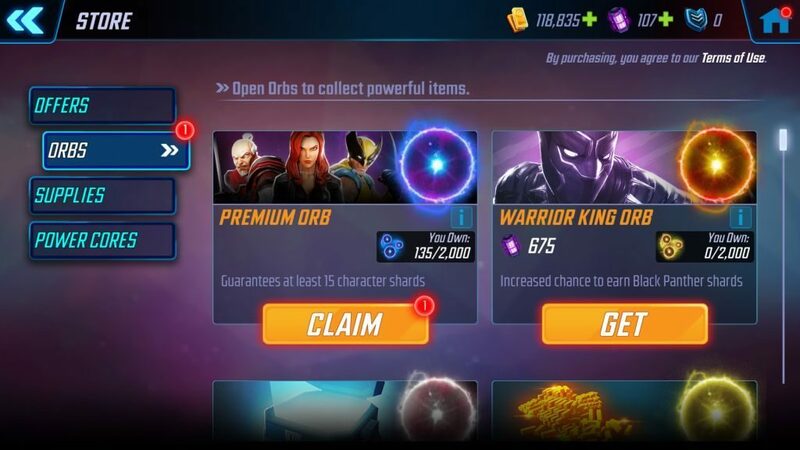 Basic and premium orbs: You will need orb fragments to open basic or premium orb. You can get these fragments from achievements, certain challenges and missions. You will need 1000 red orb fragments to unlock a basic orb. It contains 1-5 random shards and may also contain gear or gold. The premium orb guarantees at least fifteen shards, but you might get anywhere between 15-50 shards. To open it, you will need 2000 blue orb fragments. There are also special character-specific orbs such as “Widow’s Bite” that grants Black Widow shards. You will need 2000 golden orbs to get one. You can rank up a character to two, three or four-stars using duplicate shards. Once you unlock a character, collect shards of the same character and then rank him/her up to improve their stars and power level. For example, to unlock a 3-star Punisher character, you will need to collect 55 more shards to rank him up. You can refer to our previous tip on how to get shards or tap the “Find” button on a character’s profile page via Roster to know various locations where you can find shards. One big benefit of ranking up a character is that you get a huge stats and power level boost.